Air plants take in all of their nutrients (re: water) through their leaves, not their roots. Their roots only exist to attach themselves to a host tree/rock. 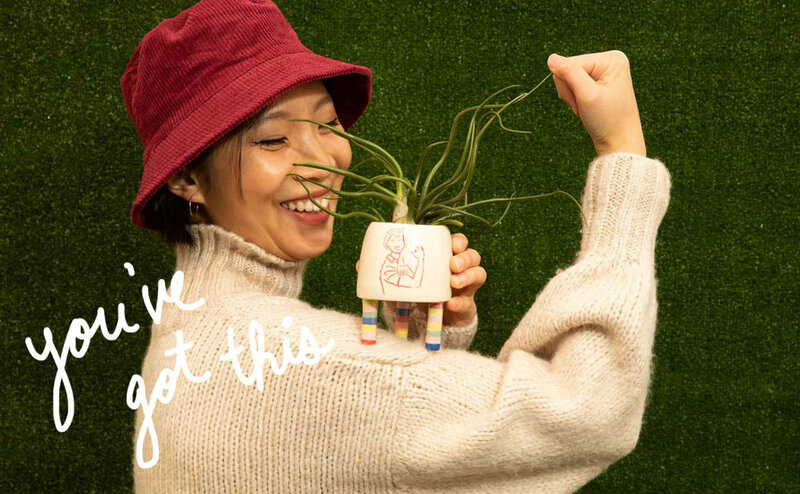 Therefore, you can just plop your air plant in an empty vessel, on a dish, or simply on your nightstand, and they will live happily. Do not plant your air plant in soil or leave floating in water - this is a really great way to kill it. The best way to water your air plant is to remove it from its super cool loloplant vessel and soak it in a bowl of room temp water for approximately 20 minutes. After you remove the plant from the water bowl, gently shake it off and place your air plant upside down on a towel for approximately 1-2 hours before returning it to its usual home. This process allows the air plant to dry out completely. THIS IS IMPORTANT! If you do not do this, your air plant will probably rot and DIE. Water in this manner every 1-2 weeks. If you live in a humid climate (or have your air plant in the same room as your shower), every 1-2 weeks is probably enough frequency for soaking. If you live in a super dry climate (or have your air plant near your radiator in the winter), you may want to spritz your air plant with a bit of water in between soakings. Your air plant will thrive with indirect natural sunlight or bright artificial lighting for several hours a day. If your office has their lights on for most of the day, then that artificial light should suffice. Air plants will eventually die if displayed in a dark hallway or super dim room for a prolonged period. If you have other house plants, such as pothos and spider plants, growing happily in the same vicinity, then your air plants should be kewl. To protect against desert drought, succulents store water in their leaves and cacti store water in their bodies. The most common way people kill their succulents is by overwatering. Only water your lil' succas when the soil is completely dry, and when in doubt... wait. It is totally possible to revive an under watered succulent, but nearly impossible to revive an overwatered succulent. During growing season/warm weather, water once every 2-3 weeks. Water thoroughly, until water drips out of the drainage hole. If there is no drainage hole, then do not water more than the soil can soak up. You do not want water sitting in a puddle at the bottom of the pot (this will FO SHO cause root rot... AKA DEATH). Leafy succulents may dry out faster if receiving a lot of hot sunlight, so once every 1-2 weeks may be more appropriate for them. In the winter season/cold weather, your plant goes doormant and will probably not grow much. Cut down watering to once a month and do not water as thoroughly, especially if the plant is not placed on a sunny windowsill. Your succulent will be happiest on or near a windowsill, receiving a bit of direct sunlight every day. However, cacti and succulents can still survive in a room with a window and not necessarily in a window. Email us if you need help determining which plants are better for your space. If you notice your plant leaning or stretching towards the light source, it's telling you it wants more sunlight. Listen to it! Move it closer to the window, at least for a few days a week. I like to leave my plants on a sunny windowsill for a day or two after watering to help it dry out a little faster, and then I move it back to its normal spot in the room. Remembah - the less light it gets, the less water it should get, and vise-versa. Why is my plant being a prick? You can try saving the non-mushy portion of a cactus by doing to following: Make a clean straight cut with a sterilized knife at the healthy portion of the plant. Let the unpotted, healthy cutting dry out and callous over out of direct sunlight for 2-3 days. Plant the cutting at least 1" deep in porous cactus soil and water when dry. Hopefully the cutting will root itself and begin a new life! If the cactus has pads (these look like bunny ears), you can try gently removing or cutting a healthy pad off and rooting/planting it in the same way as the previous instructions. You can save a leafy succulent by trying to propagate its healthy leaves. Carefully tug a healthy leaf off and let it callous over out of direct sunlight for 2-3 days. Then place it horizontally on top of at least 1" of soil. Spray the soil every few days to keep it semi moist. Soon, roots will appear out of the calloused end of the leaf. In a few weeks, a mini version of your succulent will begin to grow above these roots. Do not detach the new baby plant from its mother leaf until that leaf dies. “My cactus looks deflated and is leaning over”: That cactus is THIRSTY! Cacti are usually pretty firm and solid (like an apple) because of the water it is storing inside. If you haven't watered your cactus in a while, it will start feeding off the reserve water it stores within itself. The cactus will look deflated and lean over because it's missing the water inside. If it hasn't gone on like this for too long, simply watering your cactus should perk it right back up within a few days. “My succulent's leaves look wrinkly and deflated”: You may be under watering your succulent. Give it a little drink and see if the leaves firm up in the next day or two. Like a cactus stores water in its body, a succulent stores water within its leaves. When it's too thirsty, it will start feeding from its leaf reserve and wrinkle up. “My succulent is loosing crinkly, dry leaves at its base”: If everything else looks pretty healthy, then this is just a sign of growth! As a succulent grows taller, it sheds its bottom leaves as it grows more leaves at the top. “My cactus is getting thin and pointy at the top / My succulent looks lanky and not as full as before”: Not enough direct sunlight! Your plant is stretching towards the sunlight - this is called etiolation. Move it closer to the light source to make sure it's happy and healthy, and rotate it occasionally for even growth. I have had some really cool and funny looking cacti growth due to etiolation, and even though it's not the worst thing in the world for a cactus, they probably weren't my healthiest plants.